1-2-4-All starts with individual reflection on a question, problem, or proposal. 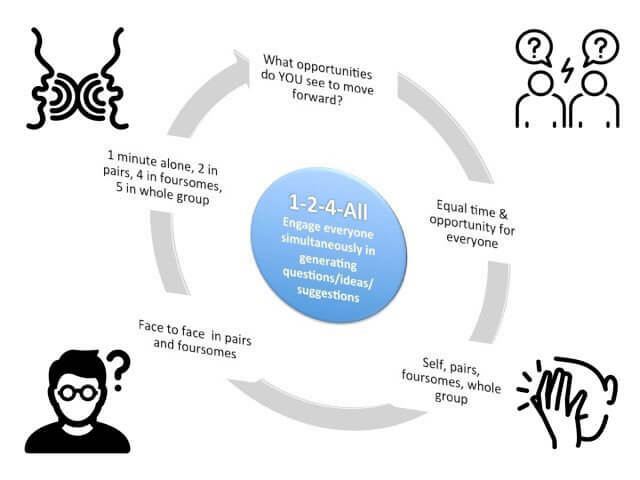 Next, pairs and then groups of four develop individuals’ ideas (a total of seven minutes work). Not a bad start, though in my experience allocating several minutes for individuals to come up with and formulate ideas is well worth the added time. It’s the jump to “All” that is a big problem. At this point, each group is supposed to have answered the question “What is one idea that stood out in your conversation?” This requires throwing away the other ideas discussed in the group. Each group shares their “one idea” with everyone during the next five minutes. In addition,” large groups” … “limit the [total] number of shared ideas to three or four”. Forcing the groups of four to discard all but one of their ideas almost guarantees the loss of important perspectives. The limited amount of time for the groups to review their members’ ideas biases the “one idea” chosen to something that seems quickly understandable and superficially attractive. Groups are more likely to reject good ideas that require nuanced understanding and/or more extensive justification. Useful ideas can focus on the “big picture” or a specific detail. I’ve observed a useful detailed idea lose out to a vague sounds-good suggestion. 1-2-4-All provides no guidance as to how each group should select its “one idea”. The process for restricting the total number of shared ideas for large groups to “three or four” is undefined. I suspect 1-2-4-All imposes this arbitrary limit to keep the entire process short. But a large group will generally have many more than four useful ideas. The surplus useful ideas are wasted. Rushing group process to quickly come up with some “great ideas” may feel good. “Wow, we’re really moving along guys!” This is an unfortunate example of how our culture often prizes efficiency over effectiveness. (Another example: lectures are the most efficient way of sharing content — but also the least effective.) The 1-2-4-All process is biased against complex innovative ideas and prematurely focuses on an arbitrarily and hastily chosen few. Decision-making that relies on the ideas output by 1-2-3-All is likely to be flawed or, at least, suboptimal. Generally, much more time will then be spent on turning these ideas into policy or outcomes. Underinvesting in idea generation and discussion leads to significant time wasted refining suboptimal, limited ideas. Under some circumstances, making quick and dirty decisions is appropriate and/or necessary. For example, making a group decision on where to hold the annual company picnic, or how to respond to an unexpected event that requires ideas and a decision in the next thirty minutes. Generating ideas using 1-2-4-All under such circumstances makes sense. Good decision-making by groups requires sufficient time to both generate ideas and review them, plus a process that involves everyone and that does not discard potentially useful ideas prematurely. A process that has been around since the 1960s and that satisfies these criteria is affinity grouping (sometimes called cards on the wall), described in the late R. Brian Stanfield‘s The Workshop Group: From Individual Creativity to Group Action and in Chapter 43 of The Power of Participation. Affinity grouping takes longer than 1-2-4-All: from 30 minutes with a small group to several hours with a large one. In my experience, affinity grouping leads to a comprehensive and rich set of ideas, discussions that allow the entire group to understand all suggestions, and clear methods to filter, cluster, and prioritize decisions and future desired outcomes and actions. I recommend you use it, rather than 1-2-3-All, whenever possible! Have you used 1-2-3-All and/or affinity grouping? What has been your experience? Share in the comments below! This entry was posted on Monday, April 15th, 2019 at 7:13 am	and is filed under Event design. You can follow any responses to this entry through the RSS 2.0 feed.You can leave a response, or trackback from your own site.